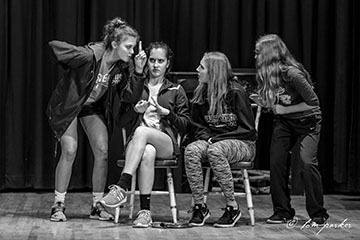 Sophomore Emma Toerber, senior Hannah Musil, junior Sam Vermetten, and junior Haylee Whitson rehearse a scene from this year’s play, The Defective Detective. The cast has been working hard to put together a family friendly comedy enjoyable for all ages. Performances will be held at the Waterville Opera House.